With a very sad heart, I must report what many of you know already. Dr. Eliza Dresang, a beloved friend and colleague, died on the morning of April 21, 2014 at the age of 72. 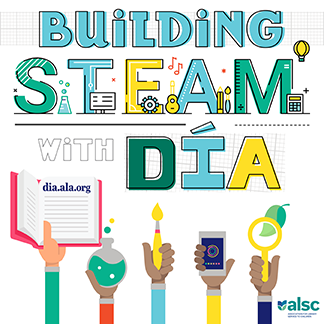 A library science professor, author, speaker, and active member and leader in ALSC, Dr. Dresang will be remembered as a strong advocate for children and libraries, but will also be remembered for her caring smile and sincere ability to really listen carefully and respectfully, helping each colleague she worked with grow and learn. It was an honor and a privilege to serve on the Notable Children’s Books committee when Eliza was chair. I learned so very much from her and it truly saddens me that I will no longer see her — or laugh with her — at Conferences. Her impact on my life will never be lost. 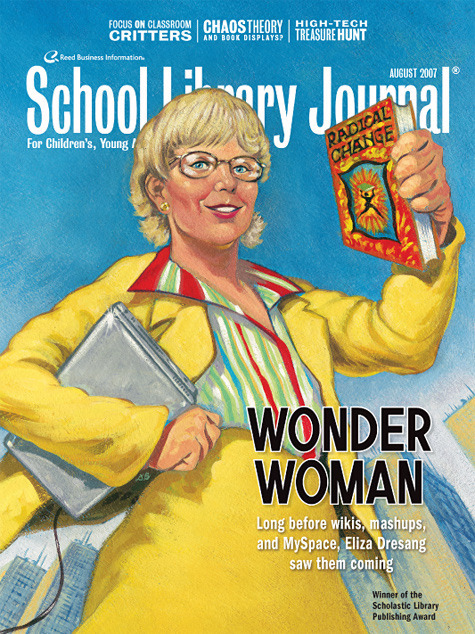 School Library Journal published an obituary which you can read here. Below, several of Dr. Dresang’s friends and colleagues offer memories and reflect on her impact on their lives. That Eliza was a woman of immense knowledge who contributed greatly to the study of children’s literature and championed library service to youth is undisputed. What impressed me most was her character. As someone new to a national level committee, not only did she focus in on my strengths and make me feel welcome, but she was always the teacher. That someone of her stature would value my views, my work, and my contributions was a badge of honor. In a career there are only a few who serve as benchmarks for how it should be done. Eliza’s voice will be there for me when an author’s or illustrator’s work comes into view. Anyone who has served on an ALSC committee with Eliza or witnessed her in action on one of her campuses knows that she worked hard. Very hard. Last summer Eliza told me she no longer could get along on four hours of sleep a night, because she then required seven hours – and she wasn’t able to accomplish as much because she needed to sleep longer! Those of us lucky enough to become acquainted with Eliza personally discovered that she also knew how to play. Very hard. Dinner at a funky restaurant? Check. Broadway show sandwiched between meetings? Ditto. Dart ball or an intriguing all-generation board game on New Years Eve? Yup, every year! Neighborhood party on the 4th of July? Not to be missed. Long trips and tours with best friends and new friends? Naturally. Annual reunions with extended family and personal friends? Of course. What did working or playing with Eliza have in common? Wherever you met her, Eliza gave you her complete attention. That’s “you.” Not a generic acquaintance, but you. Who you were. Not so very different from what Eliza wrote in 1977 for SLJ after co-leading a CCBC workshop with me: There Are No Other Children. “Special” children were individuals, not “other” in her former elementary school library. And so were Eliza’s colleagues and friends. We were each singular, unique and valued, not “other.” We are so fortunate to have worked and/or played with this remarkable colleague and friend. There is no “other” Eliza – ever. Check. 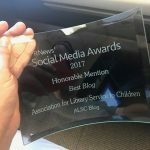 I recently had the privilege to serve a 2-year-term with Eliza on the Phoenix Picture Book Award Committee for the Children’s Literature Association. We set up the guidelines for the award and selected the first two winners and honor books. She was instrumental in the initiation up of this new book award. Her comments were always thoughtful and full of insight. She was such a gentle soul. In fact, she was selected as the chair of this committee for this year. We met last in Biloxi, MS and I have fond memories of a trip to the Gulf in the early evening with Linnea Hendrickson. Together we appreciated the beauty of the setting. Eliza gave her all for the sake of children and children’s literature. We will all miss her greatly. ALSC is filled with many smart, talented people and I have had the privilege of serving with many. Some have been the equal of Eliza Dresang but NONE are better. Eliza was the chair of the Notables Committee for my first year on the committee and she was amazing! She read as much as anyone despite the demands of being the chair, she answered committee questions the same day, she dealt with publishers with charm and grace, and so much more. Eliza was a person with whom you wanted to spend time, wanted her to speak about books, wanted her opinion. Yet she was happiest listening to others, even when (especially when??) that person disagreed with her. Eliza expected you to be smart and, consequently, you worked very hard to be better. I remember a time during our marathon Notable’s ALA discussions. We were on a break and Eliza maneuvered me into a private corner. She said something along the line of, “Ed, we just discussed ____ book. It looked like you had a concern and you did not say anything. Why?” I told her that I had been the only person with concerns for the three books immediately before it and I was worried that the audience and my committee were going to think of me as a very negative person. I told her that I was hoping someone else would express them.” She looked me in the eye and said, “Ed, our committee and our audience needs you to say what you think. I don’t care if you have concerns about a hundred books in a row. You need to speak all one hundred of them and it DOES NOT MATTER what anyone else does or does not do! If you have a concern, I expect to hear it.” Yes ma’am! Eliza agonized over whether our committee and other committees were inclusive enough. She spoke up forcefully on the fact that our committee was a committee for more than our personal constituencies. She wanted us to include the best books on our list, but she wanted us to be aware of our own cultural limitations, our own personal reading weaknesses, our own idiosyncrasies so that we had the chance of recognizing and understanding that our list includes GLBT folk, blacks, whites, Latinos, Native Americans, atheists, Asians, and other groups that do not always see themselves on the shelves of our libraries. Most of all I remember Eliza’s smile and her fabulous sense of humor. What is clear to anyone who spent more than a few minutes with Eliza is that she cared deeply about children, ALL children. She even liked older children like me! I cherish the fact that we continued our conversations after Notables, speaking about various radical ideas in the world of children’s literacy such as homelessness and prejudice in schools. We had been brainstorming a Skype visit with her students to discuss things I do in my first grade classroom germane to these topics. I am so sorry this did not happen. I will miss her and I treasure all of the time I did have with her. I met Eliza when I was in library school at UW-Madison. I worked for her on a special project of pulling recently published books and inserting the reviews for teacher/librarians to consider for purchase. I think she was head of School Librarians for Madison at the time. She treated me with such courtesy and always had time for my questions, which I very much appreciated. Later when I was selected to the 2008 Newbery Committee Eliza came and spoke to us about our charge at the very beginning during Midwinter of 2007. She was so eloquent about the process. And I will never forget that she said, “You will not select the best book of the year. There really isn’t one best book. But you will select one of them.” Somehow that freed me from all my anxiety about making the choice and I could enjoy the books in all the many ways that they excelled. Of course, we did make a choice, but I knew that we just had to do the best we could. I worked with Eliza on the 2013 Notable Children’s Recordings committee. She was, of course, inquisitive, thoughtful, professional, and passionate about books for youth in all possible formats. Since Midwinter was in Seattle that year, she had some of her students sit in on our discussions and it was evident that she was as proud of them as a teacher could be. Eliza would write me long, detailed emails about issues (and we had several that year), she would write detailed, thoughtful reviews that pulled in a wide-range of different information about every audio she was assigned, whether her review was positive or negative, and each was balanced and fair. Eliza was very excited to serve on the Odyssey last year and to work as chair of Notable Children’s Recordings this year. Even in her illness, she was positive, strong, and forging ahead. Looking back on what she achieved in ALSC and literature for youth has been awe-inspiring. Imagine what more she could have done in the future. I am shocked beyond measure at Eliza’s passing. She was an incredible person and it is an incredible loss — and not only to librarianship — but to honesty, decency, and justice. We sat next to each other (often) on Council and ALSC Board. Her thoughtful ideas were always cause(s) for thought as will be her memory. Once on Council, a vote on a resolution suggested by the California Library Association that virtually killed school libraries and librarians, there were two “Nay” votes, Eliza was the other one. RAH on her for seeing what the resolution was supporting-and what it was destroying. Every wish for grace and comfort to her family and colleagues. Yes, Eliza lived a good life and made it better for all she touched. Dr. Eliza Dresang was my master’s and doctoral advisor at Florida State University. Since I first met her in 2005, she has shaped me as a scholar and educator. I was truly fortunate to have an opportunity to take up her work and further develop her theory of Radical Change. She was delighted when I asked her if I could refine and expand her theory. Although she was a highly respected scholar, she was willing to listen to a student’s opinion and always open to discussion. At every moment I worked with her, I was impressed by her tireless pursuit of knowledge, strong academic integrity, and genuine care for others. She was an extraordinary mentor who wholeheartedly supported her students. When there was a thought-provoking but expensive conference opportunity for a student, she supported me to attend and learn. When I applied for a job, she wrote personalized and targeted letters of recommendation. Even after I came to the University of Oklahoma as an assistant professor, she was always approachable whenever I sought her advice. Just about 2 weeks before she passed away, she took the time and sent me a line saying “I am very proud of your work!” referring to my recent research grant award. She was my role model, whom I could completely trust. I know her influence will not stop and I will always remember her. One of my finest memories of her is when we attended the 2010 Scratch@MIT conference together in Boston. We really enjoyed participating in sessions, meeting new people, walking around the area and having dinner in nice restaurants. Oh, we also searched for a convenience store or vending machine that has Diet Cherry Coke. We finally found one and she was very happy! What are your favorite memories of Dr. Eliza Dresang? Please feel free to share in the comments below. Together we can help each other grieve and remember. Program in a Post: Build Your Own Belching Arena! Eliza also served on the Editorial Advisory Board of Voice of Youth Advocates (VOYA) magazine. She was such a pleasure to know and work with and contributed so much. We Board members will all sorely miss her. My condolences to all of her family, friends, and colleagues. As mentioned earlier, Eliza respected everyone’s opinions no matter who they were. It always meant a lot to me when she actually asked for mine though I was not anyone of note or importance in the library field. She truly was a lovely and generous person as well as being a “library leader”. Today I am quite sad from hearing of the passing of Eliza Carolyn. We knew each other for 60 years having gone to high school together. I have kept up with her many accomplishments over the decades and the tributes to her are so well deserved. We dated throughout high school and enjoyed life together in the 1950’s in Atlanta. Even then she was an extraordinary human being who was destined to make great contributions to others. She came from wonderful parents and is now with them in eternity. She was loved by me and so many others. Good night, Eliza, rest in peace.